The Customize Colours dialog (Visualizaton->Colour scheme->Customize) is used to modify (or reset) the colours used by Flapjack for various components of its visualization. The dialog can also be used to select the current colour scheme in use. The colours within Flapjack that can be modified are listed in the Standard colours list within the dialog. These are the colours that are used regardless of the scheme selected. 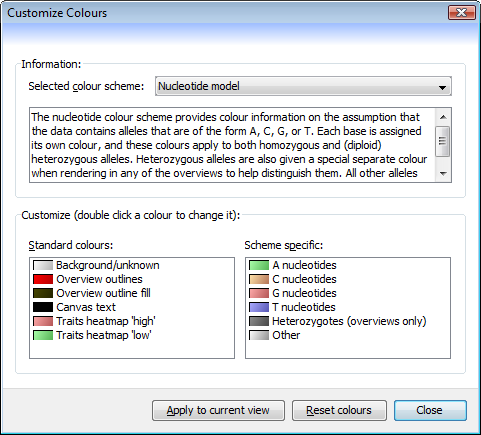 Scheme-specific colours are shown in the Scheme specific list. Changing to another colour scheme will change the list of modifiable colours. To change a colour, simply double click it with the mouse, and choose a new colour from the dialog that appears. To reset all colours (across all schemes), press the Reset colours button.